A new UN-backed study is warning rising levels of toxic brine as desalination plants meet growing water needs – the world’s 16,000 desalination plants discharge 142 million cubic metres of brine daily — 50% more than previously estimated. 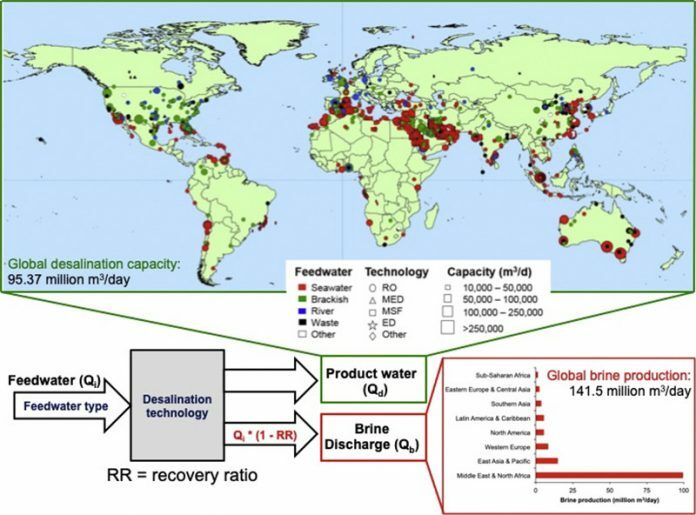 In the UN-backed paper The state of desalination and brine production: A global outlook, experts estimate the freshwater output capacity of desalination plants at 95 million cubic metres per day — equal to almost half the average flow over Niagara Falls. The paper has been produced by the UNU Institute for Water, Environment and Health (UNU-INWEH), the UN think tank on water, which is hosted by the Government of Canada and McMaster University. Starting from a few, mostly Middle Eastern facilities in the 1970s, today almost 16,000 operational desalination plants are found in 177 countries. Two-thirds of such plants are in high-income countries. The fast-rising number of desalination plants worldwide —with capacity concentrated in the Middle East and North Africa — meet a growing thirst for freshwater which brings with it the dilemma of how to deal with all the chemical-laden leftover brine. For every litre of freshwater output, however, desalination plants produce on average 1.5 litres of brine (though values vary dramatically, depending on the feedwater salinity and desalination technology used, and local conditions). Globally, plants now discharge 142 million cubic metres of hypersaline brine every day – a 50% increase on previous assessments. 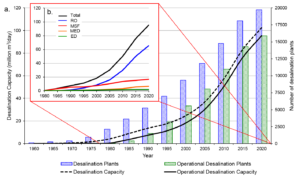 They are now calling for improved brine management strategies to meet a fast-growing challenge, noting predictions of a dramatic rise in the number of desalination plants, and hence the volume of brine produced, worldwide. Middle Eastern plants, which largely operate using seawater and thermal desalination technologies, typically produce four times as much brine per cubic metre of clean water as plants where river water membrane processes dominate, such as in the US. Brine produced inland poses an important problem for many countries located in all world regions, with 64 countries producing more than 10,000 m3/day of brine in inland locations. “There is a need to translate such research and convert an environmental problem into an economic opportunity”, author Dr Manzoor Qadir, Assistant Director of UNU-INWEH said. According to Dr Vladimir Smakhtin, Director of UNU-INWEH and a co-author of the paper, around 1.5 to 2 billion people currently live in areas of physical water scarcity, where water resources are insufficient to meet water demands, at least during part of the year. Around half a billion people experience water scarcity year round.